This is a review of Orgavit Wild Oregano Oil. The manufacturer claims that this product is 99% effective in the treatment of athlete’s foot and toenail fungus. The product is supposed to have antifungal, antibacterial, and antiviral properties, making it effective in the treatment of candida, the leading cause of foot infections. Read on for an evaluation of the expected effectiveness of this product based on active ingredients and customer reviews. Origanum Vulgare is an essential oil derived from the Wild Mediterranean species of the oregano plant. The product claims to contain up to 86% Carvacrol, the active component in oregano, which is supposed to be an antifungal agent. There is scientific evidence that Carvacrol kills candida albicans, but there has been no testing of its effectiveness involving human subjects. There is far more objective information available on the internal use of oregano oil supplements, but that information does not address the effectiveness of oregano as an antifungal agent. It is recommended to apply this product all over the feet, including toenails and in between the toes, twice a day for three weeks. There is no clear information available on the actual amount of either oregano oil or Carvacrol needed to treat toenail fungus. Also, the labeling specifies “up to” 86% Carvacrol, which is troublingly ambiguous. The manufacturer provides no information regarding possible side effects. Additionally, no information is readily available on the topical application of this product or of oregano oil in general. However, because oregano is in the Lamiaceae family of plants which also includes basil, hyssop, lavender, marjoram, mint, and sage, people who are allergic to this family of plants may be subject to an allergic reaction. Orgavit Wild Oregano Oil is available online for $9.90 for a .33fl.oz/10ml bottle. Prices for similar products vary widely, but this seems to be on the more expensive side. The manufacturer does not offer a guarantee for this product. This is troublesome, as the product claims to be 99% effective with no objective, credible evidence to support this claim. While other sellers of oregano oil claim that it is effective for the treatment of toenail fungus, no credible or objective evidence is available that backs up this claim. Because of the lack of scientific proof of Carvacrol’s effectiveness in treating candida infections in humans and a lack of consumer reviews, the claims of the manufacturer cannot be verified. The manufacturer also admits that a permanent, long-lasting solution requires the treatment of the internal cause of the fungal infection. It should be noted that there are no specific claims that oregano oil does not work for the treatment of athlete’s foot, and there are many enthusiastic, if unsubstantiated, testimonies in support of this treatment. Therefore, this product may be a good choice for someone who strongly desires to use a natural remedy rather than a pharmaceutical one. However, for those seeking a more scientifically-verified remedy, this product may not be the best choice. Click here to learn more about our Top Athlete’s Foot Treatment Products. 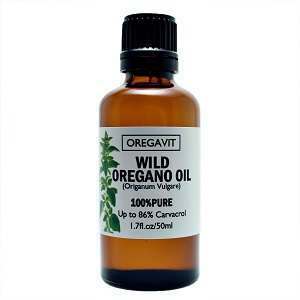 Jimmy Rodriguez	reviewed Oregavit Wild Oregano Oil	on June 23rd	 and gave it a rating of 2.5. Copyright © 2019 Athletefoot.org- All Rights Reserved.